By LUDWIG VON KOOPA - Putting the environment ahead of the player. All of the videogame publishers (if you can find a counter-example go ahead) have gone ahead and eliminated physical instruction booklets. Now on all the big videogame consoles and handhelds, if you buy a new physical copy of a game, all you get is the card/disk and a health warning or something. You might also get an expired Pokémon Omega Ruby/Pokémon Alpha Sapphire Special Demo code and other advertisements. But nothing on the game you bought and how to play it. So because this random guy doesn't like using the table of contents in an instruction manual, they'll eliminate the option altogether and instead put that very same table of contents and structure in an exclusively digital format. ...Morons. Let's hear from someone else. There is also the implied cost-savings: You don't need to pay a printing company to include all that extra stuff in your game cases (if you're buying physically at all) and now you can pay for less plastic. But “we're doing this to save money” sounds less flashy to gamers (and a lot of these gamers are in the millennial age group, the group of folks that marketing experts will tell you pay the closest attention to CSR, sustainability, and doing good for the world) than SAVING THE ENVIRONMENT. What isn't to love? You can save the environment and make production cheaper. Unfortunately, now you can't take advantages of having a copy of a paper manual independent of your game console. And there's also the issue of the game manuals themselves being worse. Having cool things like the Battalion Wars Field Manual is a gimmick that can only be done with a paper instruction booklet. There are a few reasons why I'd want a paper manual over a digital one. Back in the old days, paper manuals included some cool artwork inside them. If I was the type to do so, I might want to draw over them like a stencil. You can't do that with a digital manual. Perhaps I want to take reading material with me on the go in places where you wouldn't want to take a videogame console or handheld, like the bathroom, workplace, or in a courthouse. Just looking like you're reading something makes you look better than if it looks like you're playing a videogame (even if you're just reading something on the game system). Maybe your system is charging and you just want to know how to play the game without turning an electronic device on. Or maybe you want to reduce the amount of computer monitors your eyes have to gaze into, 'cause that's bad for you. 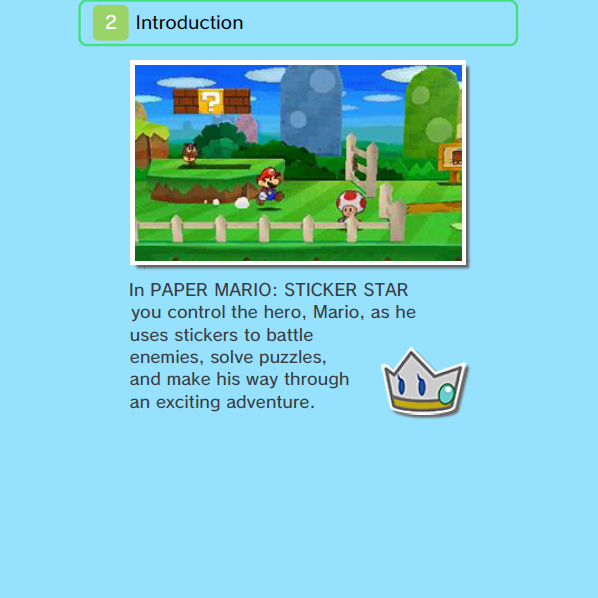 Paper Mario: Sticker Star digital manual. The first game-related section is "Introduction". It looks like this. Paper Mario for the Nintendo 64 paper manual. 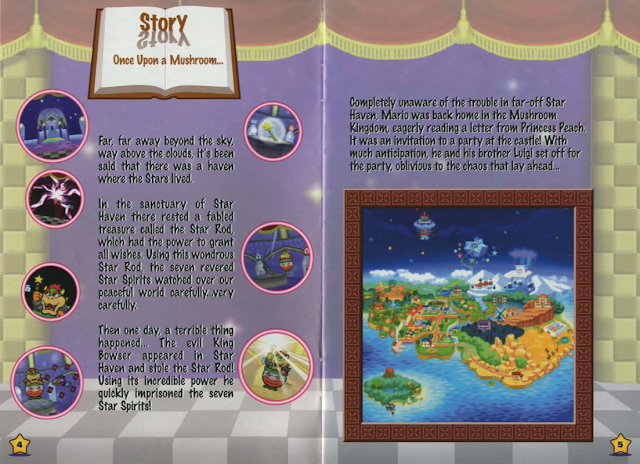 The first game-related section is "Story" and here's how it looks. It's exceedingly clear if you compare those two manuals that there is a very stark difference in the level of effort that went into them. For KoopaTV's new game, we're running into an issue for the people who are beta-testing it (which is, like, not really any of you reading this. For shame.) that they just go into the game without looking at our in-game instruction manual first. This manual is literally on the title screen with as much weight as the main game button. This is very different than hiding it in a system menu. Just would like to note that all screenshots are of the beta version. ...Though it'll probably look similar. Let's look at the above. This is the default title screen players will see for Capture the Confederate Flag. The orange box is blocking it off a little bit, but the red rectangle is labeled "PLAY!" That sounds a lot more appealing than the blue-faced "Manual". It's like, "eh, here's the manual if you want... or you can PLAY!" As of the latest beta version, this is the default title screen. The difference is that the orange selection box is now covering the "Manual" rectangle as its starting position. Now it takes more effort to get to "PLAY!" than before: Three keystrokes vs. one keystroke to just check out the Manual while you're already there. I mean, when you're done with the Manual it'll still take three keystrokes since it takes you back to this title screen, but you'll feel better about what you're getting into. Moving the starting spot isn't all we did, though! There is also a voice clip recommending first-time players to check out the “enclosed instruction book” if it's your first time playing. This voice goes away if you do check out the manual! I still want "PLAY!" to be all enthusiastic since that's the reason you got the game loaded. Putting the manual right next to the game with equal weight on the title screen is the digital equivalent to opening the game case and having the manual side-by-side with your cartridge/disk. It's the closest you can get. Ludwig hopes you will look forward to playing Capture the Confederate Flag, which will release for free shortly. Ludwig also hopes that you can see connections between his views on the videogame industry and his game design decisions! As for you, what instruction books do you hold fondly, or did you even read them? 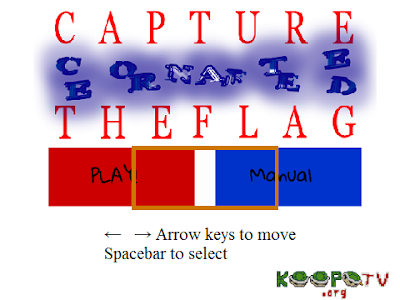 Capture the Confederate Flag is now fully playable here! How about another way of making that title screen? Something more interactive? Paper Mario: Color Splash's digital manual is quite close to the glorious manuals of old. Great going environment people. Now how are future generations going to know what Plumber Boy is talking about in the game about hotels when he says "Check out the enclosed Instruction Book" without needing to look for background information that printed material used to be enclosed in said games? It's going to be like people needing to read up on history to get certain cameos, gags and references in old Merry Melodies cartoons. I do miss physical instruction books. When I opened a new game, the first thing I always did was take out the instruction book and read it. For fun! Though I admit, sometimes the instructions were included in the game itself, so it felt useless to read how to play and then be told how to play. But sometimes they had great art or tips or even bonuses, like Ace Attorney's little comic in the back! Back in the really ol' days, instruction books gave you story details that couldn't be found in the main games. I didn't mention this in the article, but I'm totally against that sort of canon-creation. Some instruction manual writer could write whatever the hell she wants in there and a faction of the folks will think it's canon. Ick. I generally dislike that, too. I think the story should be presented... in the story. Unless it's a story-free game that just needs a basic setup explained, I suppose. ...Yeah, pretty much that trope. What if it's a tie-in novel that comes with the game, and teaches you how to play?